When I first saw pictures from Pistou’s soft opening — of dishes decked out in foams, gels and wildly colored artistry — I wondered if molecular gastronomy had truly arrived in the Burlington space where Via Loma used to reside. 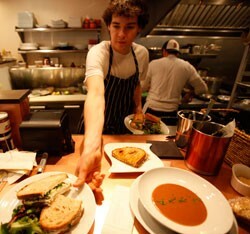 Chef Max Mackinnon, 25, is a native Vermonter who graduated from the French Culinary Institute in New York. His co-owner, Maji Chien, also 25, is fresh from the Manhattan restaurant scene, as well. Both are Middlebury College grads. Like any pair of energetic twentysomethings, they had a grand vision: They would offer breakfast, lunch and dinner, moving from house-baked scones in the morning to haute cuisine after dark, and marrying French and modern techniques to local, seasonal foods. They’d also sell a few of the finer provisions they use in a small retail area. It sounded ambitious, sort of like prodigal son returns bearing Promethean foam. With comfort food still ruling the moment, I was curious to see how the plan would play out. Because Seven Days usually waits a bit to review a new restaurant, I avoided Pistou at first, even though it’s (tantalizingly) just down the street. For weeks after the resto’s early December opening, I read longingly through every seductive menu item posted on Facebook: beer-braised short ribs with raclette cheese on a baguette; pan-seared cod cheeks; skate wing in brown butter. One afternoon, I sullenly picked at leftovers while fellow food writer Alice Levitt swooned over Pistou’s chicken-liver mousse sandwich slathered with bacon, parsley and lemon zest. The place became a lunch favorite for some in the Seven Days office. Even before I made it through the door, I could see Mackinnon and Chien had done something quite smart: tapped a solid lunch market while using their strongest culinary strokes to draw the dinner crowd. Unwittingly, perhaps, they created a genre buster — a lunch counter, restaurant and mini market rolled into one. It’s a bistro in the best sense, though I’m not sure that word crossed its owners’ minds as they planned their eatery. After culinary school, Mackinnon spent time working with David Bouley and the team at Eleven Madison Park in Bouley’s test kitchen. Earlier, in Vermont, he’d put in time with current Healthy Living Market butcher Frank Pace; his love of flesh shows on the menu. Meanwhile, Chien moved to New York to work in publishing but gravitated to restaurants, as well, working at Bar Boulud and Danji, among others. At every place the two friends landed, they privately considered how they might do things differently. The idea of Pistou germinated from “the frustration of working with other people and executing their concepts,” says Chien. The duo’s ideas became concrete when Mackinnon mentioned that he had investors, as well as family, in Burlington. Maybe they should consider opening a place back there? “It was sort of perfect,” says Chien. Last fall, they rented the shuttered Via Loma location, painted it in cool tones and gradually implemented their shared vision of an elegant eatery that avoids excessive formality while delivering exquisitely composed plates based on an understated, seasonal menu. Pistou’s lunch offerings typically include four sandwiches, a fresh soup and one or two larger dishes. On a frigid early January day, I finally succumbed, piqued by the idea of quinoa on a Red Hen baguette with Spring Brook Farm Tarentaise and wilted Swiss chard. Though the parts sounded discordant, the combination worked: The quinoa was a nutty, buttery companion to the melted cheese and assertive chard (perhaps too assertive — I removed some of it). A puréed root-vegetable soup smelled faintly of North African spices and warmed my belly. I had both — a half sandwich and cup of soup — for $12. Because Mackinnon scours the farmers market and buys produce directly from a few local farms, his ingredients tend to resurface in multiple dishes. On my return the next day, the same chard was offered on a baguette with duck, and the quinoa had migrated to a plate with lamb-rib chops and arugula salad ($14). Inside, Pistou is cozy and intimate, if somewhat austere, with 33 seats at dark-wood tables and a small, L-shaped bar. The open kitchen gives off steam and clamor in one corner, and a few shelves offer gourmet provisions, such as truffle oil. The lamb plate was simple — no sauce, no ornamentation — just two peppery and perfectly grilled chops, a handful of grains and greens dressed only with lemon juice and a kiss of oil. It was rustic and simple; the portion size, however, might not have sated a larger appetite. In the evening, the lighting inside Pistou is pretty dim, which softens its ambience but also makes it hard to see the more artfully composed dinner dishes. My companion and I were presented with a tiny amuse-bouche — a cube of duck-orange aspic served alongside a single hazelnut. The flavors jangled against each other, but it was a nice touch. The dinner menu is small and focused — a few appetizers, five entrées, and a charcuterie list of cured meats and local cheeses. Even so, we had trouble choosing — each dish had no more than four ingredients but still oozed imagination. As we dallied, I sipped a spicy, zinfandel-based red from the tiny wine list, mostly drawn from France and California. Mackinnon and Chien have crafted an imaginative cocktail list that pairs rye with Galliano and thyme, for instance, or gin with Lillet and Gran Gala. The Perfect Start — a candy-colored, effervescent drink of Absolut vodka, Aperol, and both sweet and dry vermouths — tastes vaguely medicinal, but its slight bitterness gets the digestive juices flowing ($10). Soon enough, small, saline clouds of Maplebrook burrata arrived at our table, arranged alongside earthy beets and crispy, almost ethereal polenta balls. A mince of vinegary leeks punched up this lip-smacking symphony of textures and flavors ($13). A slate board came loaded with our charcuterie selections — generous portions of silky lardo and salame from New York City’s Salumeria Biellese and ribbons of rich prosciutto rossa from Iowa’s La Quercia (each $6), along with a few char-grilled triangles of Red Hen Cyrus Pringle. Lacking light, we almost missed the small pool of orange-blossom honey on a corner of the board. A table candle would have been welcome. Even in the dark, though, it was clear Mackinnon knows good meat. We gradually scraped every bit of fat from the board. We could have left satisfied then, but entrées were still on the way. Enter beets again, this time tucked inside housemade, squishy agnolotti ($18) and blended with fresh ricotta that softened their power. Drizzled with a springlike spinach sauce, the dish was somewhat formless but tasted farm fresh. Mackinnon’s meat cred rose further with the exquisite sliced hanger steak — meltingly tender and soaked in a feather-light, earthy truffle jus, which also seeped around and seasoned buttery puréed potatoes ($24). And there was more chard, wilted and providing grassy notes. Pistou’s surprising juxtapositions don’t end before dessert — pretzel ice cream is a staple here, and it’s a luscious mound of salt, sugar and a hint of spice. The tart-sweet palate cleanser of blood-orange sorbet is a lighter way to finish off the meal — we tried both, for $3 each. When I contacted Chien the next day to talk, she emailed back, “I hope you enjoyed your meal yesterday.” So much for anonymity. I don’t think it mattered, though; Pistou is an unpretentious place with a no-fuss vibe. Service can be quite relaxed — the dishes arrived in staggered fashion, and the server didn’t know the answers to some of the questions we asked. Empty water glasses went unreplenished for a time, too. Though this serves the laid-back atmosphere, a bit more snap would mirror the careful composition of the plates emerging from the kitchen. Somewhere along the line, Pistou (probably wisely) dropped breakfast and Sunday lunch, so the staff can take a rest during the slow times. But the imaginative lunch served the rest of the week is the best way to dip your toe in Mackinnon’s artistry — and it just might draw you back after dark. A young chef’s oeuvre is bound to expand, and, a year from now — or three, or five — we may still be wondering, What will the chef dream up tomorrow?